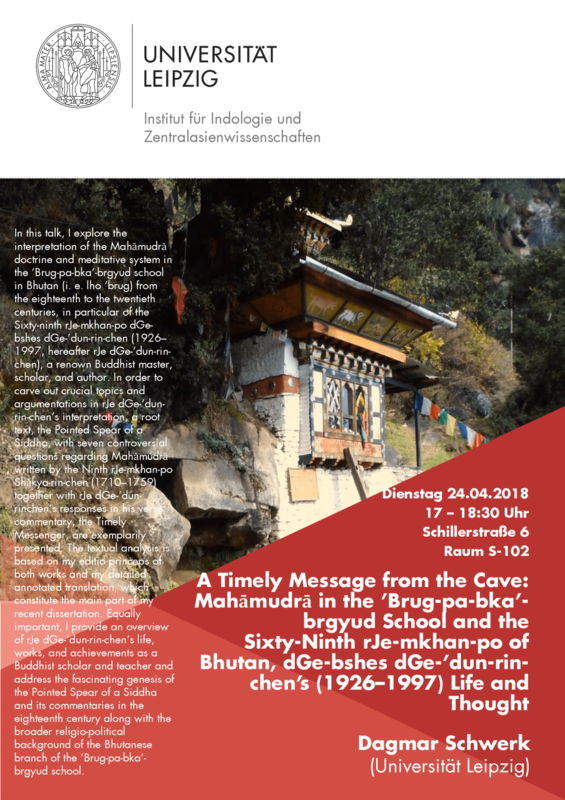 Our Senior Research Fellow Dagmar Schwerk will give a public guest lecture titled "A Timely Message from the Cave: Mahāmudrā in the ’Brug-pa-bka’-brgyud School and the Sixty-Ninth rJe-mkhan-po of Bhutan, dGe-bshesdGe-’dun-rin-chen’s (1926–1997) Life and Thought" at the Institute for Indology and Central Asian Studies of Leipzig University on 24 April 2018, 5 p.m. at Schillerstr. 6, Room S-02. In this talk, she will explore the interpretation of the Mahāmudrā doctrine and meditative system in the ’Brug-pa-bka’-brgyud school in Bhutan (i. e. lho ’brug) from the eighteenth to the twentieth centuries, in particular of the Sixty-ninth rJe-mkhan-po dGe-bshesdGe-’dun-rin-chen (1926–1997, hereafter rJedGe-’dun-rin-chen), a renown Buddhist master, scholar, and author. In order to carve out crucial topics and argumentations in rJedGe-’dun-rinchen’ sinterpretation, a root text, the Pointed Spear of a Siddha, with seven controversial questions regarding Mahāmudrā written by the Ninth rJe-mkhan-poShākya-rin-chen (1710–1759) together with rJedGe-’dun-rinchen’s responses in his verse commentary, the Timely Messenger, are exemplarily presented. The textual analysis is based on Dagmar Schwerk's editio princeps of both works and detailed annotated translation, which constitute the main part of her recent dissertation. Equally important, she provides an overview of rJedGe-’dun-rin-chen’s life, works, and achievements as a Buddhist scholar and teacher and address the fascinating genesis of the Pointed Spear of a Siddha and its commentaries in the eighteenth century along with the broader religio-political background of the Bhutanese branch of the ’Brug-pa-bka’-brgyud school.